White Dog Blog: Ways to keep your b/d dog (or any dog!) happy when it’s too cold to go outside! Ways to keep your b/d dog (or any dog!) happy when it’s too cold to go outside! This week has been bitter cold, well below the freezing mark, and the dogs and I do not want to be outside. But that means only quick trips outside to potty, and not a lot of walking or running exercise. We are all going a bit stir crazy! What to do? Here are some of the things we’ve been doing this week to burn off some energy and keep the dogs content. Will work for food – when I feed the dogs out of bowls, they are finished eating in about a minute, and then they wander around smelling all the other bowls and looking for more food! If I feed them more food, they will gain weight, which is not healthy for them, and I don’t think they are really still hungry. But they are looking for something exciting to do, and eating is an exciting part of their day. So, my dogs work for their food. Actually, it’s more like playing for their food! They have a great time and they get even more excited to play with their food than to eat it from bowls. Making eating into a game means that it takes longer for the dog to eat the same amount of food that they normally eat, plus, they get to move their bodies around and use their brains - all things that are important for their health and our sanity! We’ve posted about the muffin tin game before. I love this one! Use an old muffin tin (you can find them at thrift stores) and sprinkle your dog’s food among the muffin cups. Then take your dog’s toys and place them on top of each cup to hide the food. 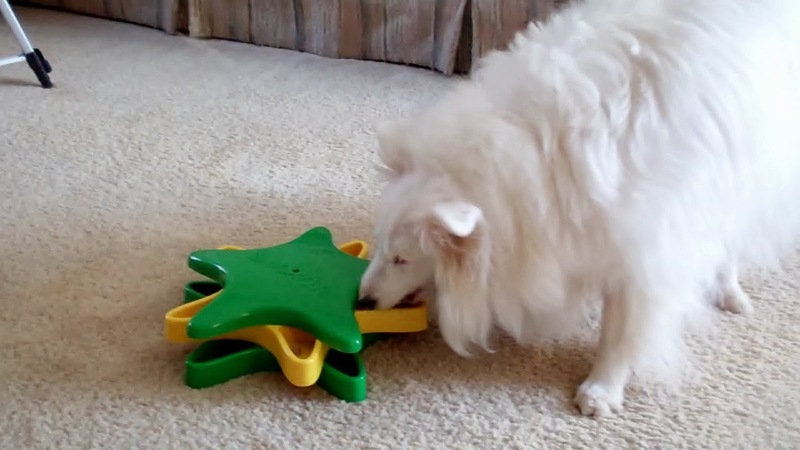 I like to use different sized toys, so some can be bumped off easily, while others will roll inside the cup and my dog has to lick the food from around the edges. 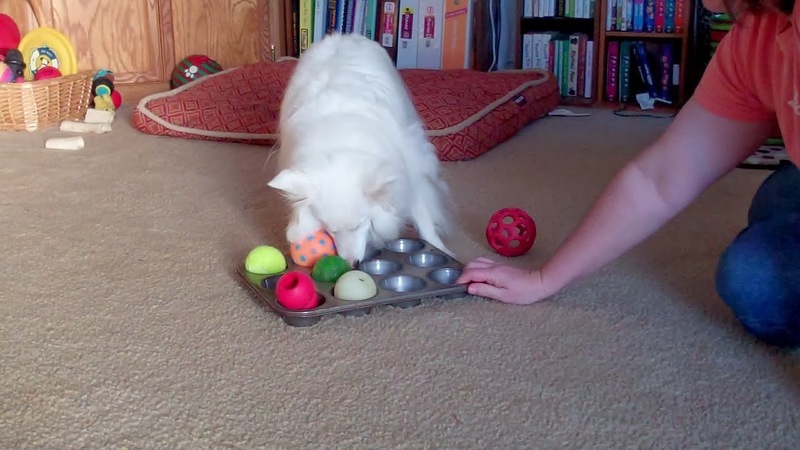 Then, let your dog figure out how to get all his food from the pan. With some more exuberant dogs, you may need to hold the edge of the pan so she doesn’t just flip it over and then gobble up all the food from the floor! With a b/d dog especially, you can create trails with her meal. Lay the food pieces out in a trail along the floor, using turns and circles to make it interesting. Start her at one end of the trail, and let her follow her nose! This can be played on a kitchen floor so it’s easy to clean up the floor afterwards. If you want to challenge your dog even further, you can lay the trail across different surfaces or under a chair. Just be sure whatever you use will be safe for your dog and she won’t get hurt or scared. Food toys and puzzles are the best! There are so many different kinds out there now. I have many different types and I rotate them, so my dogs rarely get the same one in the same week. These are good for feeding your dog her meals, but you can also put a little snack inside in the middle of the day to keep your dog occupied for a bit. Sometimes I use just the regular food, but sometimes I toss in an extra special goodie. Keeping food toys already stuffed and in the freezer can be a great indoor day saver! When your dog is getting stir crazy, grab a frozen Kong or other toy from the freezer to keep her content and allow you to get things done. I mix my dog’s regular dog food with some canned food to make it mushy. Then I stuff the Kongs full of the mixture (I recommend doing this step in the sink!) and pack it in tightly. Wrap the Kongs in a plastic bag and place in the freezer. Freezing the Kongs means the dogs need to work even harder and longer to get all the food out. They stay busy chewing and licking for a long time. Usually, dogs will sleep after having a good long chew, so when they are finished, they are usually content to relax quietly for the rest of the afternoon. Learning new tricks is always fun for me and the dogs. Treasure is learning some new tricks that not only make her think in new ways, but also require her to use her body in new ways. So she is building muscle and getting in shape while we have fun together! After you’ve exercised your dog’s mind for a bit, it’s time to curl up and spend some quiet time together! After all, what good is a nice warm puppy on a cold day, unless you are snuggled up together? Soft petting, massage, Healing Touch for Animals®, and TTouch® can all be wonderful ways to connect with your dog and promote relaxation and health, for both you and your dog. And, with any luck, it will be sunny and warm enough tomorrow to go out and enjoy the walking and running exercise that is so important to us and our dogs! Happy Winter! Woof!